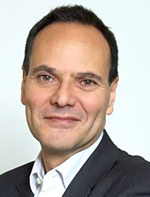 Kantar CEO Eric Salama is said to be recovering well in hospital, his injuries 'neither life-changing nor life-threatening', after being stabbed 'near the heart' with an 'enormous knife' by a man attempting to steal his car in Kew, London on Sunday. Britain's national papers reported that 57-year-old Salama returned to his Ford Focus after leaving a nearby coffee shop around 8 o'clock on Sunday morning to find a man sitting in the driver's seat, who then attacked him. He managed to stagger back to the Café Torrelli, where he was helped until paramedics arrived. According to the Daily Mail, shop owner Fasink Nizri said: 'Eric is a decent man and has no problems with anybody. The person tried to steal his car; he asked 'what are you doing?' 'He was stabbed just near his heart, it was very bad - the knife was enormous - he was hit so hard that the knife it bent. Our staff managed to stem the bleeding, then we called his son and an ambulance, it was terrible, terrible. The man that did this was trying to steal his car, it was a car-jacking - Eric was in the wrong place at the wrong time'. DRNO will keep readers in touch with any further substantial news on this story. We wish Eric a speedy recovery after this horrific attack.